Halloween is such a fun time of the year where many people host parties or attend one. What’s a party without cupcakes?! 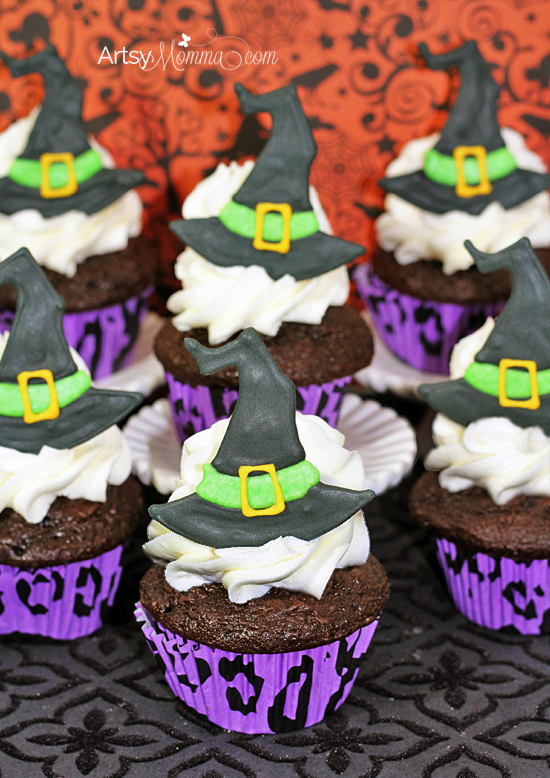 I just love all the Halloween cupcakes – it seems like there is an endless amount of possible ways to decorate them. 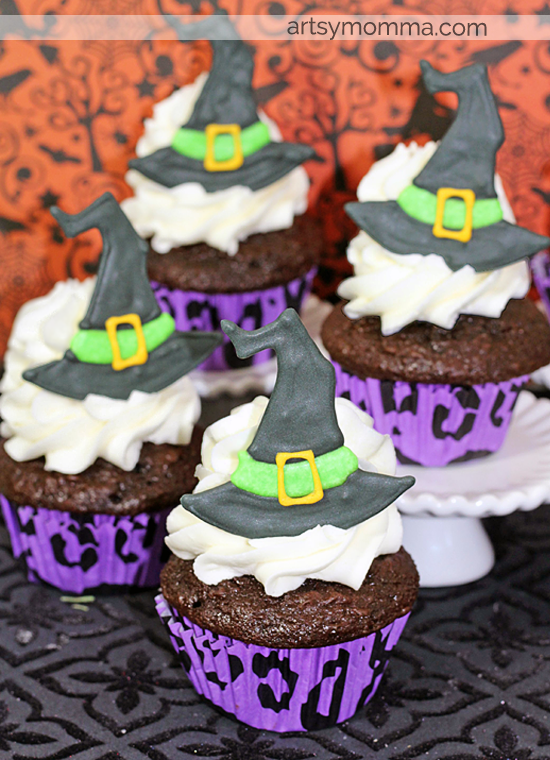 These witch hat toppers made with royal icing are sure to wow everyone at the party! Preheat oven to 350 degrees. Line the muffin tins with cupcake liners. Mix the flour, sugar, dark cocoa, baking soda, baking powder, and salt in a bowl. In a separate bowl mix the eggs, whole milk, oil, and vanilla. Add it to the bowl holding the dry ingredients. Mix all together. Beat for 3 minutes on medium. Fold in mini chocolate chips to the batter. Scoop the cupcake batter into liners until 3/4 full. Allow to cool for 10 minutes. Take the cupcakes out of the pan and set them on a wire rack until completely cooled. Cream the softened butter and powdered sugar until it looks light and smooth – adding several drops of the heavy whipping cream until creamy and can form a stiff peak. Test to see if the frosting can form and hold a stiff peak by taking a spoonful of frosting and turning the spoon upside down. If the frosting stays on the spoon it is ready, if not then add more powdered sugar a little at a time mixing well. Test again to make sure that the frosting can make and hold a stiff peak. Scoop it into the pastry bag with a large tip. Twist the open end of the pastry bag to push the frosting to the tip. Start by frosting from the cupcake edges continuing inward to the center of the cupcake. Combine the powdered sugar, egg whites, and cream of tartar in a mixing bowl. Mix on medium speed for 4 minutes. If icing is not stiff enough, add 1/4 cup powdered sugar. Spoon 3/4ths of the icing in a bowl. Add several drops of black gel food coloring. Stir to mix colors. Take 1/4th or the remaining frosting and place in another bowl. Add several drops of goldish-yellow gel food coloring, mixing well to blend the color. Place the remaining icing to a third bowl. Add green food coloring. Mix well. Find a picture of a witch’s hat graphic by doing a quick search on the internet. Print the pictures of the witch’s hat in color and multiple on one sheet. Tape the printed paper to a cookie sheet. Tape wax paper (equal to the size of the printed paper) over the witch’s hats on the cookie sheet. You will be using this as a template for your cupcake toppers – woohoo! Easy, peasy. Use a small pastry bag fill with the black royal icing and a #2 tip. Outline the witch’s hat first and then fill in the black part of the hat. Allow this to dry for 30 minutes. 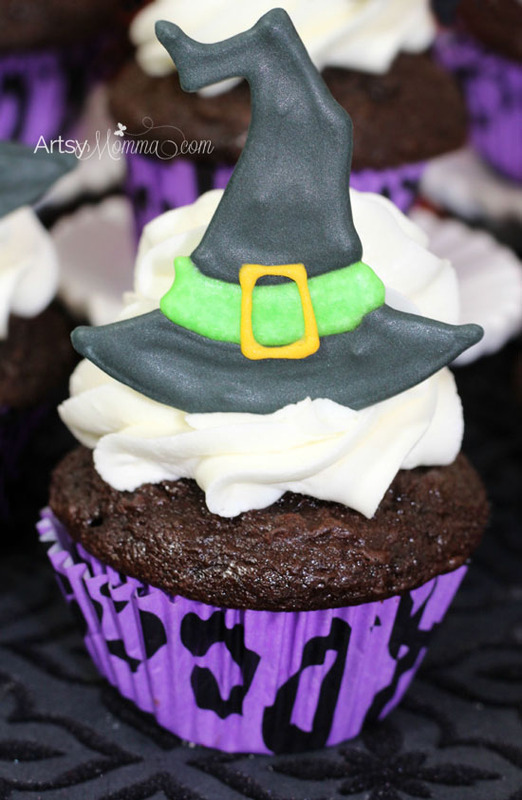 Take the green icing and spoon it into a small frosting bag with a #2 tip. Outline the hat band in green and then fill it in. Allow this to dry for 30 minutes. Add the golden yellow gel food coloring to a frosting bag with another #2 tip. Outline the buckle, then fill it in. Check to see that the image is dry by gently touching one of them with your finger. If you are able to push in the icing, allow it to dry a little longer. When the image is dry, it will have feel hard and you won’t be able to push in on it. 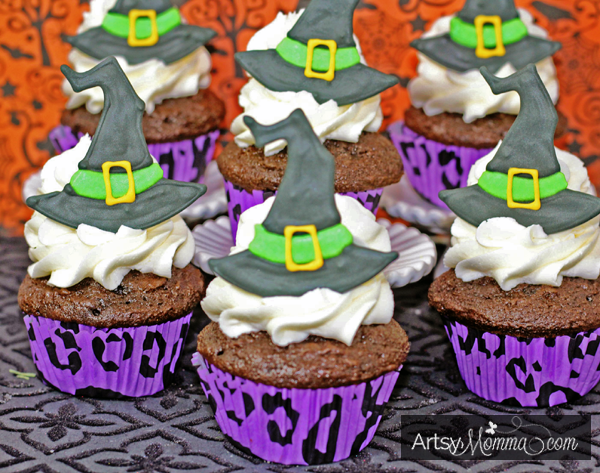 Cut the wax paper with the dried witch’s hats into squares (1 hat per square). Carefully peel the wax paper off of the back of the cupcake toppers. Place them on the frosted cupcakes.